NIMBY Alert! NIMBY Alert! The Washington Post reports that residents of downtown Alexandria, Virginia, are up in arms over the likely use of the Alexandria Federal Courthouse to try some or all of the detainees now held at Guantanamo Bay's Camp Delta. An outcry is growing in Alexandria over a prospect no one seems to like: terrorist suspects in the suburbs. "We would be absolutely opposed to relocating Guantanamo prisoners to Alexandria," Mayor William D. Euille (D) said. "We would do everything in our power to lobby the president, the governor, the Congress and everyone else to stop it. We've had this experience, and it was unpleasant. Let someone else have it." "I've never agreed with people who say 'not in my back yard,' but there are just too many people around here," said Jim Boulton, president of the unit owners association at the Caryle Towers condominium complex [located in the immediate vicinity of the courthouse], which has been trying to get the government to remove security barriers left over from the Moussaoui trial. "They need to find someplace else." Moussaoui, et al, have to go somewhere if Camp Delta is closed, don't they? Why shouldn't that be Alexandria, where 71% of the city residents voted for Obama last November? I take it for granted that Mayor Euille, Mr. Boulton, and everyone else quoted by the WaPo support the administration's announced intention of closing Gitmo. Mayor Euille ought to do everything in his power to lobby the White House for the privilege of hosting those prisoners in his city, not to pass the buck to some other jurisdiction. Where's the courage of his convictions? It looks like the typical Alexandrian's support for closing Gitmo shrinks as the distance between them and the Gitmo detainees gets smaller. The FBI was tweaked last week for its notorious lack of responsiveness to Freedom of Information Act (FOIA) requests. A small part of the problem is the Bureau's Famous Backwardness at Information handling, but mostly it's a matter of contempt for the law. The Federal Bureau of Investigation (FBI) today won the fifth annual Rosemary Award for the worst Freedom of Information Act performance by a federal agency. The FBI’s reports to Congress show that the Bureau is unable to find any records in response to two-thirds of its incoming FOIA requests on average over the past four ears, when the other major government agencies averaged only a 13% “no records” response to public requests. [U]nless a requester specifically asks for a broader search, the FBI will only look in a central database of electronic file names at FBI headquarters in Washington. This search will miss any internal or cross-references to people who are not the subject of an investigation, any records stored at other FBI offices around the country, and any records created before the 1970s, which are stored in paper form and only indexed using a manual card catalog. When requesters send their requests directly to relevant field offices for processing, the FBI’s policy is to automatically route all requests back to headquarters for the same inadequate search. Until the requester files suit in federal court, the FBI will not perform a broader search. According to the FBI’s own reporting, the Bureau has also deterred requesters by making them wait — an average of 374 days (about a year) for complex requests, compared with the 20 days mandated in the FOIA. The FBI also has a longstanding practice of refusing to process requests for documents about a living individual without a signed privacy waiver from the person permitting the release of his or her records. Last year, this policy stopped in its tracks a student journalism project to learn about the murder of Wall Street Journal reporter Daniel Pearl in Pakistan — the FBI would not process their requests because they did not submit privacy waivers signed by captured 9/11 planner Khalid Sheikh Mohammed and convicted shoe bomber Richard Reid, among others. So what new? FOIA is merely a public law, but the FBI is a law unto itself. Passport, the Foreign Policy magazine blog, has a story today on the ruckus the Major of Mexico City is kicking up over the U.S. embassy's practice of blocking access to a public street that adjoins the embassy property: Has the U.S. annexed a Mexico City street? Mayor Marcelo Ebrard ... has taken up the cause of reopening Rio Danubio, a narrow one-way street off Paseo de la Reforma, the capital's main promenade modeled after the Champs-Elysees in Paris. 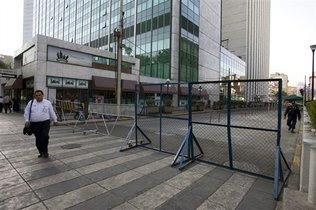 "The Embassy has not had, nor does it have, authorization to occupy public spaces," Ebrard told reporters. "They shouldn't be the ones who occupy the city with the aim of providing security." Passport links to this story from the Miami Herald, which provided the above photo. His Honor the Mayor may or may not know why the practice of blocking access to Rio Danubio started, since it goes way back to 1986, but it was, in fact, for the purpose of providing better security to the visa applicants who line up outside the embassy. The section of Rio Danubio in question is a one-block stretch that runs between the embassy office building and the Marie Isabel Sheraton hotel. (In the photo, the embassy is just out of view on the right; the Sheraton is the building on the left.) In 1986, the embassy's consular section was located in a lower level of the embassy office building and visa applicants queued up along Rio Danubio to be admitted into the embassy, one small group at a time, via a side entrance that was roughly in the middle of the block. The street had a fair volume of vehicle traffic, some of it associated with a side entrance into the Sheraton, and it was not unusual for cars to be parked there. In May 1986 a group calling itself the Commando Internacionalista Simon Bolivar parked a carbomb on Rio Danubio next to the hotel's side entrance. That put the bomb directly opposite the routine daily queue of visa applicants; clearly, it was an attempt to cause mass casualties. Fortunately, the bomb was discovered and rendered safe by the police (if I recall correctly, the bomb's crude homemade timer had failed), so no one was injured. To protect against another such attack the U.S. Ambassador at the time, John Gavin, insisted that the local authorities allow the embassy to take control of Rio Danubio. They refused, until Ambassador Gavin applied pressure by shutting down all visa processing in Mexico City, after which they caved in pretty quickly. Another Ambassador might not get away with shutting down visa processing - Gavin was an old Hollywood friend of President Reagan's, and he seemed serenely assured that he would remain Ambassador for so long as he wished no matter what kind of protests the government of Mexico and its allies in the U.S. made to the Secretary of State - but it's an option worth considering in case Mayor Marcelo Ebrard gets out of hand. In case you were wondering how L. Paul Bremer, the former Proconsul of Iraq, is spending his spare time these days, here's a story from the Washington Times Arts section of a few days ago: Former Diplomat Turns to Oils (the kind of oils you paint on canvas, that is, not the kind that powers the world's economy). Mr. Bremer says he decided to take up painting after finishing his 2006 book, "My Year in Iraq." These days, he serves on several corporate boards but devotes most of his spare time to painting and cooking. He has taken art classes taught by local painter Walter Bartman at the Yellow Barn Studio in Glen Echo and plans to sign up for another course this spring. "I am just a beginner," he says. Bremer does not paint desert scenes, but he does create great dessert scenes. Time spent in Baghdad has had no influence on his painting, he says, but he uses Iraqi ingredients such as pomegranate molasses and dried limes in his gourmet cooking. When Bremer isn't painting, he's using his training in classical French cooking to whip up things like Fontainebleau garnished with pomegranate molasses. Here's his recipe for Fontainebleau, but be warned that you'll need to prepare this one day in advance. It seems that Bremer used to make this dish with plain old raspberry coulis and whole raspberries as garnish, but his year in Iraq introduced him to exotic local fruits like pomegranate that add a nice Middle Eastern twist to the classic French dessert. Wow! With Bremer doing so much painting and fancy cooking, I'm amazed that he still finds the time to sit on corporate boards. A Federal judge has issued the largest-ever award to a returning military reservist who successfully sued his former employer under the Uniformed Services Employment and Re-employment Rights Act (Former Reservist Wins $1 Million From Employer). In a case centering on a little-frequented corner of the employment rights of troops returning to civilian life, a federal judge has ruled that Wells Fargo must reinstate a former reservist to his job as a financial adviser and pay him at least $1 million. A jury decided last June that Wachovia had violated his rights under the Uniformed Services Employment and Re-employment Rights Act, which requires employers to provide workers returning from service a salary, status and seniority similar to what they had before leaving. It was left to Judge Arterton to decide damages. She did so on Thursday, affirming the jury’s verdict and awarding Mr. Serricchio about $400,000 in back pay and interest, $390,000 in punitive damages, and reimbursement for his legal fees, which are likely to top $500,000. His new salary will be $144,000 for one year, the court ordered, after which he will be back to working on commission. Although this case dealt with the narrow matter of reinstatement of employees who were paid on commission, I can't help but expect it will strengthen the hand of returning reservists in general, who all too often haven't gotten their jobs back after a deployment, the law notwithstanding. It seems that almost anything can be blamed on the French. The FBI is now promoting a theory that the 1971 American skyjacker D.B. Copper was a fan of a French comic book series and took his nom de skyjack, "Dan Cooper," from the French-Canadian hero of that series. You have to read it to believe it. In the fictional series, Royal Canadian Air Force test pilot Dan Cooper takes part in adventures in outer space and real events of that era. 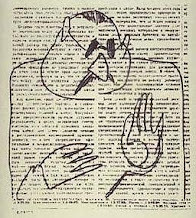 In one episode, published near the date of the hijacking, the cover illustration shows him parachuting. Seattle Special Agent Larry Carr, who took over the Cooper case two years ago, believes it’s possible the hijacker took his name from the comic book (the enduring “D.B.” was actually the result of a media mistake). That’s important because the books were never translated into English, which means the hijacker likely spent time overseas. This fits with Carr’s theory that Cooper had been in the Air Force (see sidebar). Special Agent Carr's theory, incidentally, is that maybe Cooper was one of the hundreds of thousands of U.S. military troops who spent time in Europe in the '60s and early '70s, and maybe he had some kind of duties that called for him to wear a parachute without being a trained parachutist - as the skyjacker D.B. Cooper evidently wasn't - and maybe he then got a job in the aviation industry in the Pacific Northwest, and then maybe he was laid off in 1971. That's a lot of maybes. I can't help but speculate that Special Agent Larry Carr must not be a rising star in the FBI. How badly did he have to screw up to get assigned to the case of a 1971 skyjacking and robbery by an unknown suspect who almost certainly did not survive his skydive? Comicanuck, an expert on French-Canadian comic books - yes, seriously - examines the comic book connection at length here: The Pursuit of Dan Cooper RCAF: FBI explores link between DB Cooper and comic book hero. The French newspaper Le Figaro reported on Thursday, March 19, that the Obama administration sent a très sympathique yet somewhat puzzling note to the President of France. Everything seems to be in order. But the kicker is that the note was written to the former President of France, Jacques Chirac, not to the man who replaced him almost two years ago, Nicolas Sarkozy. Le Figaro is reading political significance into the note because they assume the use of the word "peace" was a veiled reference to Obama's differences with current-President Sarkozy over the war in Iraq. For all I know, maybe it was. Maybe Obama is sending subtle digs at Sarkozy. But I find it odd that Obama would deliberately associate his policies with a has-been French politician who left office with a trail of scandals behind him. Anyone who has worked in Washington for more than a week knows not to attribute intent to something that can be explained just as well by incompetence. It is entirely plausible that the note was drafted by a protocol guy in the embassy who more or less automatically produced a safely bland and unobjectionable President-to-Président sentiment, and just didn't quite focus on the implications of Obama pledging to work harmoniously for the next four years with someone who is no longer President of France. A plain old gaffe is so much more likely than a fiendishly clever veiled message. I'll bet the only message associated with this note was the Homeric "D'oh!" that sounded in the political section of U.S. Embassy Paris after the text was published. Le président américain vient d'adresser une lettre très sympathique à Jacques Chirac, selon l'expression de ce dernier. "Je suis certain que nous pourrons au cours des quatre années à venir collaborer ensemble dans un esprit de paix et d'amitié afin de construire un monde plus sûr," écrit le successeur de George W. Bush au prédécesseur de Nicolas Sarkozy. En évoquant le mot de paix, Obama rend un hommage implicite à l'action de l'ancien président français qui s'était opposé à la guerre en Irak. Une intervention américaine contre laquelle le futur président américain s'était opposé comme sénateur, lors du vote au Congrès. It could have been worse. At least the note didn't come with a pile of American-format DVDs of Hollywood classics. On the other hand, Chirac has unlimited free time these days so maybe he would have appreciated that, especially if any of those classic films featured Jerry Lewis. A U.S. Peace Corps volunteer, Kate Puzey, age 24, was murdered last week in Benin, where she had spent two years teaching English. The Atlanta Journal-Constitution reported about her today (Georgia Peace Corps Worker Killed in Africa) and noted that she kept a blog: Being in Benin, trials and tribulations of a mud hut princess. Her last post was on October 14, 2008, and it is followed by numerous RIP comments from her friends that began coming in yesterday. Rather poignant stuff. The Smoking Gun has posted a declassified six-page court filing by five of the 9/11 defendants currently being detained at Guantanamo Bay, which they (the defendants) titled "The Islamic Response to the Government's Nine Accusations." Read it here. MARCH 10--Proclaiming themselves "terrorists to the bone," five Guantanamo Bay detainees defend their roles in the September 11 terror attacks in a war crimes court filing released today by the Pentagon. The document, a copy of which you'll find below, is labeled "The Islamic Response" to nine charges filed against the suspected al-Qaeda members, a group including Khalid Sheikh Mohammed, one of the attack's masterminds. Describing the charges as "badges of honor, which we carry with pride" the men contend that "killing you and fighting you, destroying you and terrorizing you...are all considered to be great legitimate duty in our religion." Along with relishing the death of thousands, the men mock the U.S. government's inability to detect the terror plot. "Your intelligence apparatus, with all its abilities, human and logistical, had failed to discover our military attack plans before the blessed 11 September operation. They were unable to foil our attack." The detailed screed was released today over the objections of lawyers for two of the defendants. Mohammed and two other men are serving as their own lawyers. I really wonder what will finally be done with Khalid Sheikh Mohammed and his cohort. A couple of generations ago, the U.S. military meted out justice to war criminals swiftly and unapologetically (and even filmed it for the historical record), but that was in an age much less squeamish than ours. Most likely, KSM will spend many years watching cable TV in a cell at the Federal supermax prison in Florence, Colorado. If so, he'll be right next to several of his peers: Omar "the Blind Sheik" Abdel-Rahman, Ramzi Yousef, Zacarias Moussaoui, Wadih el-Hage, Richard "the Shoe Bomber" Reid, José Padilla, and Mahmud Abouhalima. Our government seems to have no clear idea of what to do with those miscreants, despite much agonizing over the matter. Sixty years ago, two Military Police sergeants with a noose would have dispatched the whole lot of them in under an hour. My old friend the "Fortress Embassy" trope is in the news again, but this time the hoopla is over a domestic U.S. State Department office building, the U.S. Mission to the United Nations in New York City. The Washington Post story that ran Thursday (Hardened U.S. Embassies Symbolic of Old Fears, Critics Say) had a perfectly accurate headline, but the reporter, and the critics, seemed to be confused about which particular old fears are pertinent to a domestic government building vice an overseas embassy, and about where the impetus for more secure domestic buildings came from. 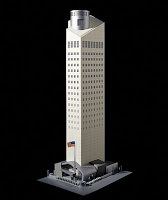 UNITED NATIONS, March 12 -- Across the Manhattan street from the landmark buildings of the United Nations, a new architectural symbol of American outreach to the world is rising: an impenetrable concrete tower with 30-inch-thick concrete walls and no windows on its first seven floors. Built to endure a chemical- or biological-weapon attack or an explosives-laden truck careening up Manhattan's First Avenue, the new U.S. mission to the United Nations will offer the most secure diplomatic quarters in history when it is completed next year. The 26-story building is one of a new generation of hardened U.S. diplomatic outposts. More than 60 high-security embassies and consulates have been constructed in the Middle East, Europe, Asia and Africa over the past eight years. The primary goal is greater protection for the 20,000 American officials serving in those facilities, but the buildings have also been criticized as enduring symbols of the fears and anxieties that gripped the United States in the wake of the 1998 bombings of two U.S. embassies in East Africa and the Sept. 11, 2001, terrorist attacks. "The attacks of 9/11 are not a sufficient excuse for this bizarre edifice. [TSB Note: they seem like a pretty good excuse to me, however, they are actually not the reason for the secure design of this particular edifice.] I think the building sends an entirely wrong signal to the United Nations, and the world," said Stephen Schlesinger, an author who has written extensively on the United Nations. "Rather than being an approachable, beckoning embassy -- emphasizing America's desire to open up to the rest of the globe and convey our historically optimistic and progressive values -- it sits across from the U.N. headquarters like a dark, forbidding fortress, saying, 'Go away.' "
The latest quest to better guard America's diplomats began in 1998, when members of al-Qaeda simultaneously bombed the U.S. embassies in Kenya and Tanzania, killing 224 people and injuring more than 5,000. A review of U.S. diplomatic security in the wake of the bombings concluded that more than 180 U.S. embassies and consulates were vulnerable to terrorist attacks, and Congress mandated an unprecedented construction spree to replace those structures. The 9/11 attacks, which felled two Manhattan skyscrapers, only reinforced the need for safer buildings. The Bush administration appointed Charles E. Williams, a retired major general from the Army Corps of Engineers, to lead the construction. Williams's Bureau of Overseas Building Operations developed a Standard Embassy Design, a one-size-fits-all blueprint that has produced dozens of high-security look-alike embassies and consulates for the State Department. Williams won praise for the speed with which the buildings went up, but also criticism that his approach sometimes resulted in shoddy work and, in the building of the $730 million embassy in Baghdad, contracting irregularities. State Department officials defend the program, saying that a car bomb attack against the U.S. Embassy in Yemen last August underscored the threats still facing American personnel. "We wish the world was a safer place," said Jonathan Blyth, a spokesman for the Bureau of Overseas Building Operations. "However, in the last 10 years since the bombings in East Africa, the world is a more dangerous place. We need to construct facilities to put American diplomats in safe and functional facilities for them to advance foreign policy and ultimately, hopefully, make the world better, safer and more secure for all citizens of the world." Blyth said that State has drawn on some of the world's best architects to build high-profile U.S. embassies in cities like Berlin and Beijing. The architectural firm Skidmore, Owings & Merrill was recently awarded the American Institute of Architects' Excellence in Architecture Design Citation Award for the Beijing complex, perhaps the most elegant embassy. But Richard J. Shinnick, who replaced Williams, has conceded that many of the U.S. buildings lack grace. In a talk to industry advisers in September, Shinnick described the past eight years as "the dark ages as far as the design culture was concerned." Foreign critics have been hostile to the Standard Embassy Design. "There is hardly a modern building in existence -- with the exception of nuclear bunkers and pesticide-testing centers -- that is so hysterically closed off from public space as this embassy," Germany's conservative Frankfurter Allgemeine Zeitung said of the Berlin building. John Rubell, whose firm Moore Ruble Yudell Architects built that embassy, was taken aback by the lashing it received in the German news media, which he thought was unfair. But he said that it may be time for embassy architects to address the critics. "We have to deal with certain realities," Rubell said. "The security issues are real, but at the same time we need to design buildings that don't primarily express that fact." A glance at the U.N. mission makes it hard to think of anything else. Its rough concrete exterior contrasts with gleaming glass luxury towers that sprang up around Manhattan in the boom years that followed Sept. 11. Charles Gwathmey, whose firm Gwathmey Siegel & Associates Architects designed the mission for the General Services Administration, said the building will feature an inviting glass entryway, set off by an Alexander Calder stabile, to passersby and visitors once the project is completed. But the transparency ends at the lobby elevators. The windowless floors at the base of the building will be filled with computers and other high-tech equipment that cannot be described to the public. Gwathmey was most proud of the building's concrete skin, noting that he had received a call from the renowned architect I.M. Pei, who asked him, " 'How did you get that beautiful concrete?' He thought it looked fantastic." I was curious about Stephen Schlesinger, that critic of bizarre edifices, so I looked up his website and found out he's the son of historian Arthur Schlesinger, Jr., and is a former director of the World Policy Institute. Unlike most critics of Fortress Embassies, he's not an architect or urban planner but just somebody who - judging by the events listed on his website - really, really, really likes the United Nations a whole lot. He even wrote a hymn of praise to the founding of the UN (Act Of Creation: A Story Of Superpowers, Secret Agents, Wartime Allies And Enemies And Their Quest For A Peaceful World) that is currently ranked #1,944,199 in sales by Amazon.com, where you can purchase a copy for as little as $1.49. But I digress. To get back to the new USUN Mission headquarters, it is indeed a physically secure building - see the photo below of the architect's model - although the only visual clue to that is the absence of windows on the lower six stories. Otherwise, it's just another concrete high-rise in a city full of concrete high-rises. In fact, it strongly resembles the ATT Sony building, which is probably not a coincidence since the same architectural firm worked on both buildings. However, despite its security features, the USUN building should not be grouped together with overseas Fortress Embassies, since: (1) it was designed under contract to the General Services Administration, not the State Department's Office of Overseas Buildings, and (2) it does not follow the famously onerous security standards that apply to U.S. embassies. Consequently, it is not at all isolated or remote, and it has no setback from the street, being built on a third of an acre in Manhattan across from the UN and wedged between the Ugandan UN Mission, a glass-box hotel, and some office towers. So, if the new USUN building isn't an OBO Standard Embassy Design, why does it have all that hardening against bomb blast and chem-bio attack? Because as a domestic U.S. government building of a certain type, the USUN Mission must meet applicable domestic security standards that are established by the Interagency Security Committee (ISC), which is an activity of the Department of Homeland Security. Those domestic security standards did not originate with 9/11, but with the bombing of the Murrah Federal Building in Oklahoma City six years earlier. A federal government task force assembled after that incident recommended a set of protective requirements for government office buildings which the Clinton Administration immediately adopted. The USUN Mission is just another Federal agency that has to provide the level of office building security specified by the ISC and implemented by the General Services Administration. There is no reason to connect those security measures to 9/11, or to defend them by reference to attacks on U.S. embassies overseas. The new building will be about 40 miles from the U.S. attorney's office in Alexandria, where agents frequently travel to meet with prosecutors, bring witnesses to grand jury sessions or testify before the grand jury or in court. Some Northern Virginia-based agents also frequently travel to the District and occasionally to Maryland, law enforcement officials said. To get back to Prince William, agents will have to navigate a 20-mile stretch of I-66 west from the Beltway, sometimes during rush hour, plus four miles on a mostly rural section of the Prince William Parkway near Manassas. The FBI's Tysons office, by contrast, is about 17 miles from the U.S. attorney's office. "It makes absolutely no sense," said one FBI agent, who is not an official spokesperson and requested anonymity. "We've all just been scratching our heads and thinking, 'How did they come up with this?' "
Hey, welcome to the club! U.S. diplomats have been asking themselves that question for many years now when new embassies are built. At least those FBI agents who will have longer travel times can take some satisfaction from knowing that their new Field Office complies with ISC standards and is secure against a repeat of the Oklahoma City bombing. Personally, I would regard that as worth some inconvenience. By Law, No "Immigrant" Can Be "Illegal" or "Undocumented"
I like the dressing-down the Washington Times received in today's Letters to the Editor from an immigration lawyer who objects to the Time's new, and surprisingly PC, editorial policy of referring to illegal aliens as "illegal immigrants." Parsing the 'I-word' lays out the only descriptive options that should be available: one can be an immigrant, or an illegal alien, but can't, by law, be an "illegal immigrant." By law, every person who is not a U.S. citizen or national is an "alien." Aliens are divided into broad "lawfully admitted" and "illegal alien" categories. Lawfully admitted aliens include immigrants admitted for permanent residence, temporary nonimmigrants, refugees and individuals paroled into the United States by the federal government. An "immigrant" means "every alien except" nonimmigrant aliens who are eligible for temporary admission. No alien may enter the United States without a valid immigrant visa, or proving to an immigration official that they only seek to enter temporarily for a specific purpose authorized by law, such as study, tourism or journalism. Aliens in the United States who have not been lawfully admitted or have violated the terms of their admission are, as recognized by the courts, properly classified as illegal aliens. Illegal aliens include "unlawful entrants," "immigration violators," "aliens previously removed," and "aliens unlawfully present." "Undocumented alien" is less accurate. It only describes a subclass of aliens who do not possess a valid visa and travel document "at the time of application for admission." By law, no "immigrant" can be "illegal" or "undocumented." The promiscuous use of these contradictory terms by journalists is misleading and lazy. Some nonimmigrants may transfer from one classification to another. Similarly, certain nonimmigrants can "adjust state" to become an immigrant. It is, however, inaccurate to describe Guandique [TSB Note: the author is referring to Ingmar Guandique (Ingmar? Did his parents conceive him while watching a Swedish movie?) the illegal alien from San Salvador who was recently charged with the high-profile murder of Chandra Levy in Washington DC several years ago] as "eligible" for temporary protected status, if approval of an application for that status was "denied." I see that Senator Lugar has called on the State Department to "reinvigorate the old American Center concept" of cultural outreach facilities that are located apart from embassy office compounds. A good idea, I think, and one I've commented about here. But after the Cold War, the United States prematurely declared victory in the battle for hearts and minds, terminating the U.S. Information Agency, which ran the centers, and cutting the State Department's public diplomacy budget. Many thought the Internet and global satellite TV would render irrelevant the people-to-people exchanges fostered by the centers. Separately, U.S. diplomatic facilities overseas became more isolated. Following the 1998 bombings by Al Qaeda of two U.S. embassies in Africa that killed 12 Americans and more than 200 Tanzanians and Kenyans, the United States embarked upon a major construction program to build new embassies protected against terrorist attacks. Many embassies are now far from city centers and impose time-consuming security procedures upon all visitors. Additionally, most U.S. civilian employees are required to work within the embassy perimeter. Those security upgrades were necessary, but the result has been less day-to-day interaction between U.S. diplomats and locals. Stripped-down outreach facilities, now called Information Resource Centers (IRCs), are often located within embassy compounds and open to the public by appointment only. State Department statistics show that IRCs within embassy walls in the Middle East received only one sixth as many visitors as those off-compound. Clearly, reaching a wider audience will require creative adjustments to the United States' security approach, keeping in mind that the safety of U.S. personnel must be paramount. As part of a broader overhaul of its public diplomacy effort, the United States should reinvigorate the old American Centers concept - putting, when possible, new ones that are safe but accessible in vibrant downtown areas - support active cultural programming, and resume the teaching of English by American or U.S.-trained teachers hired directly by embassies. That would help draw people to the centers and ensure that students got some American perspective along with their grammar. "Many embassies are now far from city centers"
Actually, only new embassies - meaning those that were built under the new construction program that started around 2000 - are located far from city centers, and not all of them are. Only 21% of our embassies and consulates are new ones, so I doubt the location factor alone can account for a systemic loss of public access. Many of the remaining 79% of our diplomatic facilities are right smack in the middle of downtowns areas, even those so excessively 'vibrant' (Damascus and Belgrade, for example) that it would be safer for our embassies to be a little more distant. Still, I take his point: our embassies get fewer walk-in visitors than our old American Centers did. Incidentally, I get my information about the percentage of new diplomatic facilities from a recent General Accountability Office report which noted that from 1999 to 2008 only 64 new embassies, consulates and annexes were completed, and from the State Department's website which lists a bit over 300 overseas diplomatic missions. "[M]ost U.S. civilian employees are required to work within the embassy perimeter"
The Senator is referring to what is known as the collocation requirement, in accordance with which all the offices and agencies under the authority of the Ambassador in a given country must be located together on a single compound rather than scattered around town. I must note the collocation requirement is not some State Department security standard, but rather part of Public Law 106-113, Title VI, Section 601, known as the "Secure Embassy Construction and Counterterrorism Act of 1999." The same law also requires every diplomatic facility to have a certain setback distance between it and the perimeter of the property on which it is located, something which is rarely possible in downtown areas and therefore contributes to the embassy remoteness problem. Site Selection - In selecting a site for any new United States diplomatic facility abroad, the Secretary shall ensure that all United States Government personnel at the post (except those under the command of an area military commander) will be located on the site. Perimeter Distance - Each newly acquired United States diplomatic facility shall be sited not less than 100 feet from the perimeter of the property on which the facility is to be situated. In this title, the terms `United States diplomatic facility' and `diplomatic facility' mean any chancery, consulate, or other office notified to the host government as diplomatic or consular premises in accordance with the Vienna Conventions on Diplomatic and Consular Relations. "Clearly, reaching a wider audience will require creative adjustments to the United States' security approach"
Clearly, it will. And I, for one, am all in favor of creativity in approaching security problems. However, no adjustments can be creative enough to overcome the collocation and setback restrictions imposed by Public Law 106-113. If Senator Lugar really wants to be helpful, he ought to sponsor a bill to amend the law so as to exempt American Centers. Then we might be able to open a few in those city centers where he wants them to be. This sounds like something new. The State Department invited two Palestinian journalists with popular blogs to attend the Gaza reconstruction conference in Sharm el Sheikh, Egypt, as the SecState's guests. "We feel it's important to reach out and engage the new social media, and bloggers are a significant part of this new media," department spokesman Robert A. Wood said. "It's essential that the work of the State Department be disseminated as widely as possible, and they help get our message out." One of the two, Fadi Abu Sada, was not allowed to enter Egypt. As a Palestinian under the age of 40, he needed an Egyptian visa, and had failed to get one. The other, Daoud Kuttab, was good to go since he's a Palestinian over the age of 40. And, although the above press report doesn't mention it, he's also a naturalized U.S. citizen, so I assume he could have entered Egypt on his good old U.S. passport. Here's the report by the last Palestinian blogger left standing at the conference: My short meeting with Secretary Clinton. HAC's Public Session Was Far From "J'Accuse"
On the rare occasions when I have to go to the State Department's headquarters building in Washington DC (my workplace is across the river in Rosslyn, Virginia: "Land of Government Annex Buildings"), I usually get lost trying to find the office I want. But yesterday I knew I was in the right place as soon as I walked in. It looked just like a faculty meeting, with most of the men wearing khakis and tweed sport coats. The shirts were mostly open-collared, and there was even one turtleneck. Sensible shoes were the norm. Backpacks outnumbered briefcases by about 5-to-1. Hardly anyone was wearing the blue suit / red tie uniform that you normally see in that building. I can't tell whether or not the Historian's Office has become, professionally speaking, an intolerable place to work, but at least it looked like a comfortable place to work. I didn't really expect drama at yesterday's public session of the Historical Advisory Committee (HAC), and there wasn't any. There were no resignations in protest, no mass walk out, no fist-fights, not even any harsh language. If there will be any confrontation of Dr. Marc Susser over the accusations brought against him of mismanaging the Historian's Office, I assume it will be done in private and more likely by Undersecretary for Management Patrick Kennedy than by the HAC itself. The public session took place with nothing said about the elephant in the room. On the agenda was a review of HO's plans for future production of Foreign Relations of the United States (FRUS, pronounced "Froose") volumes, and a report on the Department's progress on the review and declassification of historical documents. The closest anyone came to touching on a sore point was when a few members persistently questioned the wisdom of the Historian's announced intention to produce only about 38 volumes on the Reagan years, which would be fewer volumes than were produced for comparable eight-year periods. There seemed to be a consensus that 38 or so volumes would not be enough to properly document foreign relations during the Reagan years. There was also a discussion about the pros and cons of publishing electronic FRUS volumes versus the traditional hard volumes. It seems the limited research that HO has done into its market, i.e., the users of the FRUS (usually scholars and graduate students, often ones located outside the U.S.), indicates that e-volumes would suit them just fine. The same amount of labor is needed to produce either kind of publication, however, the e-volumes are cheaper and have a shorter time to publication, so they seem like the better way to go. Dr. Susser said little during the session, but I believe I heard him mention that the HAC has now sent its most recent annual report to Congress. That's interesting, assuming I heard correctly, since a heavily annotated draft of that report figures prominently in the storm of accusations and counter-accusations that has been raging since the resignations of the former HAC Chairman, William Roger Lewis, and the principal drafter of that report, committee member Thomas Schwartz. I wonder who approved the final report? And when will the Congress make it available? Before I knew it the public session was over, we few visitors left the room, and a closed session began on the topic of declassification. The next big development in the crisis within the HO will most likely be the report of the Inspector General investigation that is underway, and its probable recommendations regarding reconfiguring the Historian's Office. Douglas Selvage, a historian and former employee of the State Department's Office of the Historian, has set the scene for this week's meetings of the Historical Advisory Committee with this post at the History News Network. Hat Tip to "Anonymous" for pointing out the post to me. We can only hope that this week’s Historical Advisory Committee meeting will provide additional information about the state of things at HO [Office of the Historian], including any potential reorganization. Within a few weeks, the OIG should complete its inspection [TSB Note: the Office of the Inspector General began a review of HO on February 20, at the request of the Undersecretary for Management], and its report should be made public as soon as possible. This will make clear whether the Department of State plans to take all necessary steps in terms of organization and personnel to ensure the timely publication of “thorough, accurate and reliable” FRUS volumes, in keeping with statutory requirements. It will also make clear whether the Historical Advisory Committee, the historical community, and the general public need to undertake further efforts to ensure openness and transparency at the Department of State and to save the Foreign Relations series. I'm anxiously awaiting today's public session of the Historical Advisory Committee. Neither snow [there's about 6 inches on it today] nor sleet, nor freezing rain, etc., shall stay me from my appointed round. Not that there will be any fireworks at that session, but after so much highly public airing of the HO's dirty laundry, I'm curious about the personalities involved. Using The Godfather as a parable for thinking about foreign policy is not a new idea, but I'm just now catching up with The Godfather Doctrine by John C. Hulsman and A. Wess Mitchell. It makes sense to me. Why not? People have been drawing an analogy between President Bush and the latest Batman movie for months (see this), and I'm sure The Godfather provides much more food for policy thought than Batman does. Batman might have the edge in philosophical interest - see Batman and Philosophy: the Dark Knight of the Soul for more on that - but for lessons in wielding power, how could you go wrong with the greatest gangster film of all time? It's modern-day Machiavelli right down to the olive oil. In this cast of characters, Tom Hagen is the mob diplomat whose ultimate goal is to return the family to peaceful multilateral relations and the status quo ante, and who expects that Sollozzo can be accommodated just as the Corleones have always done with rival mobsters. Sonny is the hothead who responds with preemptive militarism and will let business suffer while he tries to destroy all his enemies even if it makes the other New York families line up against the Corleones. Michael is the realist who assesses a strategic change coming to the mob world and the family's corresponding need to change in order to survive and thrive. Michael responds to the new situation with plenty of violence, but carefully targeted and controlled violence that destroys only those enemies that cannot be dealt with otherwise. He keeps his eye on the geostrategic ball even as he settles all of the family's business. It's no more far-fetched than any other movie analogy, and it does seem to line up with the major political circles or schools of thought. - Intelligence & Foreign Policy: What Do Your Rats Tell You? - Political-Military Affairs: When is it Time to Go to the Mattresses? In all seriousness, everybody I know can quote from The Godfather on all sorts of occasions. On 9/11, when my co-workers and I were watching the Twin Towers fall on a TV screen, and then looked out of our Arlington office to see a column of smoke rising from the direction of the Pentagon, one of us - a long-time veteran Regional Security Officer - said: "this is the business we've chosen." It didn't seem at all inappropriate, and it expressed what we were all thinking at that moment about how our professional lives would be changed by the day's events. The movie does seem to resonate with most people. Long ago, when I was looking for academic works that would explain the convoluted military politics of Central America, a specialist in the region told me to read the Valachi Papers. He was serious, and that old mob memoir proved, in fact, to be a good source of insights into the very similar world of conspiratorial circles and internecine warfare that I was studying. We could do worse than to use The Godfather as a lens for interpreting power politics.